Bottom Line Up Front: This is a 4.85 out of 5 stars album. What I really like about this album is how appealing the songs are throughout the album. While Weird Al’s singles collection has to be one of the strongest in existence, I can’t say every song in his discography holds up to multiple listenings for me. So I’m taken back with how well this album stood up to the relentless repetition over the week. Artist Background: Ah, Weird Al. Where to begin? Well, he is a pretty damn smart guy. He graduated valedictorian of his high school at 16. He got his breakthrough with Dr. Demento. The guy has been releasing albums for a long freaking time. We are talking a steady output of parodies since the mid-70s. There’s really too much to talk about so let’s try to stick to the highlights. He had a lot of success in the 1980s, thanks to his parody music videos. Notably, Eat It, which was a parody of Michael Jackson’s Beat It. It’s worth watching both of them as Eat It is a nearly perfect shot for shot recreation. He also starred and wrote his own movie in 1989, UHF. I loved the movie as a kid and I think I love it even more now as an adult. Okay, there’s just too much even just talking about highlights. I need to move onto the album. And the Wikipedia link is always available at the end of the review anyways if you want to know more. Favorite Track: Weird Al said the people would probably riot in the streets if he didn’t include a polka medley on his albums. I would most definitely be smashing the **** out of shopfront windows if such a thing were to happen. By default, regardless of what else is on the album, the polka track is always going to be my favorite. If Polka Face wasn’t being played, I was counting the tracks until it’s back up again. Here’s a tip for you since you’ve been so kind as to still be reading up to this point: listen to Polka Face while watching these penguin gifs. Isn’t that breath taking? It’s like he writes the song just for those penguins. Style While most of the style parodies went over my head, it doesn’t mean I didn’t enjoy the crap out of them. For example, I loved CNR. It had such a classic 70’s rock feeling to it. It reminded me a lot of Fever Dog from Almost Famous. Not so much that it sounds like it but that I wish the song was a real song from the 1970s cause it’s so damn good. There’s also a beautiful nod to the classic Jim Croce’s You Don’t Mess Around with Jim in it. Make sure to check out the others. Commentary I also like Al’s social commentary that he includes with his songs. In TMZ he simultaneously makes fun of celebrities, the tabloid industry and the people who fund it all by wasting spending time and money obsessing over it. Rhyming When he is singing about very specific topics and situations, I’m incredibly impressed with the lyrics. To figure out what words need to be used to make everything come together and be so entertaining is almost unbelievable. The man is a genius. But this could be just a side effect of me having such a terrible vocabulary so you might not agree with me here. Rhyming I’m not contradicting myself here. I did include a qualifier. I didn’t say his lyrics were always impressive. After listening to this album over and over, I started to notice there were times when his rhymes were just nonsense rhymes and really anything could have been used there. For some reason, that started to annoy me. You could rightfully make the argument that the nonsense rhymes are for comedic purposes. However, in the song Ringtone, he starts talking about all the people that hate his ringtone and he just starts listing the most random people/groups. And to me it just comes off as lazy when his other rhyming is just so amazing. Maybe I’m wrong here but this is what I felt. In Conclusion: This is such a great album. There are so many enjoyable songs throughout. If you never warmed up to the idea of listening to Weird Al, this would be a good place to start. Ever since Straight Out of Lynwood, he has been on a serious roll. His latest album, Mandatory Fun, was his first album to ever debut at #1. It wasn’t a fluke or an accident. It’s the result of a consistent output of strong material over the past couple albums. 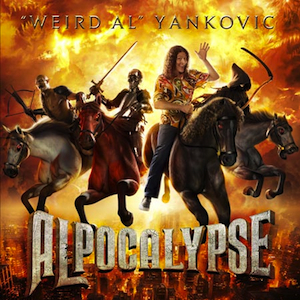 We are living in a Weird Al renaissance. Take advantage. * – Assuming you don’t cheat. Junior Woodchuck’s honor here.